Intellian v100GX (1.03m) is a Ku-band VSAT maritime antenna system convertible to Ka-band for Inmarsat’s Global Xpress™(GX) network. Featuring fully optimized RF performance for Ku or Ka-band, the v100GX provides advanced VSAT solutions for Ku-band satellite services that are also designed to be upgraded when the system is configured to the Ka-band GX high throughput broadband services. To make the future conversion process easy and simple, the v100GX is equipped with a new mounting architecture of RF module consisting of BUC and LNB. The mounting assembly of BUC and LNB is simply attachable to the rear-side of the reflector so that it will be easily replaced without the need to balance the system after conversion. The v100GX is built to meet or exceed the industry’s most stringent standards such as FCC, ETSI, R&TT and MIL-STD-167. With its frequency tuned radome and newly designed reflector, the v100GX offers the maximized performance both on a Ku-band VSAT system and a Ka-band Inmarsat Global Xpress system. The antenna’s 3-axis stabilized platform and advanced shock-resistant and vibration damping design of the Pedestal is fully optimized to withstand the demanding maritime conditions and to ensure reliable broadband communications. The unlimited azimuth range ensures continuous tracking without unwrapping the cables in the antenna and the low elevation angle (-20°) supports seamless signal reception at extremely high latitudes. Equipped with Intellian’s next generation Antenna Control Software, ‘Aptus®’, the v100GX antenna can be remotely accessed, monitored and controlled through Serial connection or secured TCP/IP network. Its graphic-based user interface provides easy-to-use operating environment. The v100GX has also embedded webserver and secured web user interface called Web M&C for remote management of the antenna on a web browser. Network connection can be easily setup through the front Management Ethernet Port on the ACU that supports automatic IP configuration. The v100GX is fully integrated with ABS (Automatic Beam Switching) function with various platform compatibility such as the OpenAMIP protocol of iDirect and the ROSS Open Antenna Management (ROAM) protocol of Comtech. The v100GX is supplied with both cross-pol and co-pol feeds and comes equipped with Intellian’s patent pending Global PLL LNB by standard. The v100GX can be converted from a Ku-band system to a Ka-band GX™ system by a few simple steps. The v100GX is equipped with an integrated RF module consisting of BUC and LNB. This BUC and LNB mounting assembly is attached to the rear side of the reflector in order to support easy conversion and balance-free installation. The v100GX is designed and engineered to operate on both Ku and Ka-band. The reflector of the v100GX is capable of handling either Ku or Ka-band without the need to replace the reflector when the system is converted to Ka-band. The system is supplied with a Ku-band feed chain as standard. The 1m reflector for the v100GX satisfies EIRP and G/T performance of both Ku and Ka-band. To ensure efficient operations for both Ku-band VSAT and Ka-band Inmarsat Global Xpress™ systems, the v100GX has the tuned radome to minimize signal loss while offering improved RF pattern for both Ku and Ka-band systems. Intellian v100GX is capable of detecting DVB-S/DVB-S2 signal, SCPC, and Narrow- Band signal using integrated digital tuner and the narrow band detector (NBD). Intellian’s next generation Antenna Control Software, ‘Aptus®’ is developed based on the Intellian developed ‘Antenna Remote Management System (ARMS) Software Development Kit (SDK)’. This graphic-based software is designed to remotely monitor and control Intellian antennas through an IP network. The v100GX has a Management Ethernet Port on the ACU front that enables direct and simple network connection between a PC and the ACU. The Management Port supports DHCP network connection by default, allowing automatic IP configurations, Internet access and quick access to Intellian’s remote management solution, the Web M&C. The built-in WiFi wireless network card enables the ACU to be wirelessly connected that can be either turned on and off by a switch. Any kind of wireless devices such as PCs, laptops and smartphones can be used to connect to the ACU and monitor, control and change the settings of Intellian antenna system wirelessly. Users can also access and control the antenna with a PC that has Bluetooth capability. The Bluetooth connectivity enables wireless antenna monitoring and control from a PC without Ethernet or Serial Cable connection. Intellian v100GX provides easy and intelligent firmware upgrade methods. Firmware upgrade can be automatically initiated by plugging a firmware stored USB Memory Stick to the USB Port on the ACU front or by launching ‘Firmware Upgrade’ on the Aptus® or Web M&C. User can also manually select a firmware file on a local disk and complete the upgrade. The firmware can be rolled back to a previous version as the ACU’s built-in memory stores the current and previous firmware files. 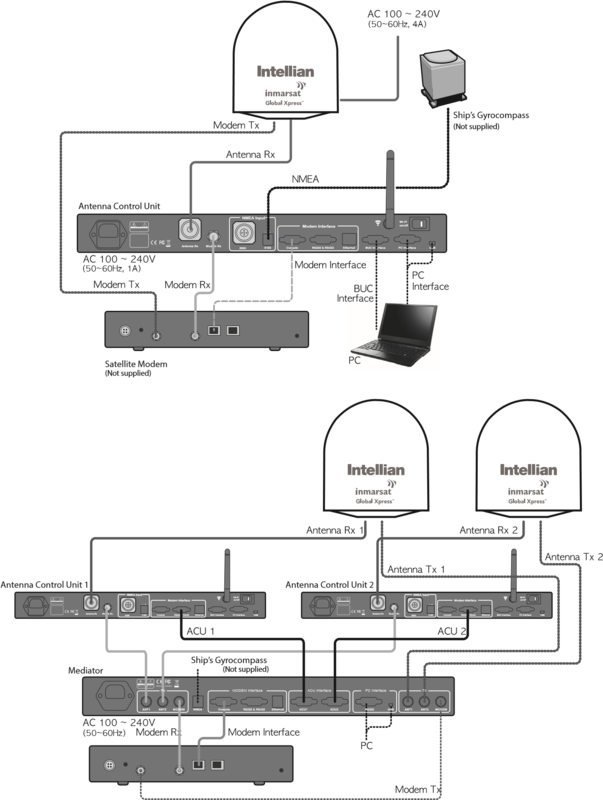 For your satellite communication system to work properly, the system will have to be connected with all of the provided components as shown in the figure below. Separate purchase of a satellite modem, ship’s gyrocompass, and Intellian Dual VSAT Mediator may be required.